You can't see because it's invisible :) If it wasn't invisible, you would see it. How can you read something you can't see? Invisible books exist too: you don't have to be invisible to read them but, even if you were invisible, it wouldn't help. If you were invisible, you'd be blind. The world around you would be as invisible to you as you are to the world. There are transparent objects but they are still visible with a bit of effort: Vistalite drumkits are transparent but they are still visible. If you get colourful invisibility, it becomes visible. There are invisible colours but they are only invisible to us, not to other animals. Un jour o� leur ennui �tait � son comble, un lapin se pr�sente � eux, avec, dans les mains, une pancarte sur laquelle est marqu� � Attrapez-moi !!�. Les chiens courent donc apr�s le gibier aux longues oreilles, et sont alors attir�s dans une soucoupe volante, d'o� semble venir le lapin. Ils se retrouvent d�s lors prisonniers des "Lapins de l'espace", craints dans tout l'univers, m�me des fourmis g�antes de Betelgeuse. Nos deux chiens, devant choisir comment �tre mang�s, vont faire enlever Billy le chat, qui va alors, avec ruse, les tirer d'une bien mauvaise situation. Ce livre est un v�ritable enchantement! Il est construit comme suit: du texte sur la page de gauche, des dessins sur la page de droite. L'histoire est tr�s dr�le, support�e par des dessins tr�s expressifs qui font v�ritablement rire. Nathalie JEAN-BART joue avec ma�trise avec la typographie du texte, la mise en page des dessins et la couleur de ces derniers. L'auteur �crit aussi en deux langues; en effet sur une m�me page, le texte est r�dig� en fran�ais et en anglais. Nathalie JEAN-BART �tant fran�aise et habitant � Londres, une partie n'est pas la traduction de l'autre. Ainsi l'auteur glisse des jeux de mot dans les textes fran�ais qui ne peuvent appara�tre dans le texte anglais, et vice versa. Lire le texte dans les deux langues n'appara�t plus fastidieux (enfin� �a l'est moins). Un livre divertissant, qui promet un bon moment de lecture! One day, as the two dogs are bored to the extreme, a rabbit turns up in front of them, with a sign in his paws saying "Catch me!!". The dogs are only too happy to oblige and chase the rabbit, until they are all sucked up inside a flying saucer. From now on, Harry and Henry are held prisoners by the Space Rabbits, feared across the all universe by everybody even the Giant Ants from Betelgeuse. The two dogs, forced to choose how they are going to be eaten, make the Space Rabbits kidnap Billy the cat, who will ultimately trick their way out of trouble. This book is a pure delight! It is built as follow: the text is on the left page and the drawings on the right page. The story is very funny and supported by very expressive cartoons that cause genuine hilarity. Nathalie Jean-Bart shows skill in playing with the typography of the text, the layout and colours of the drawings. 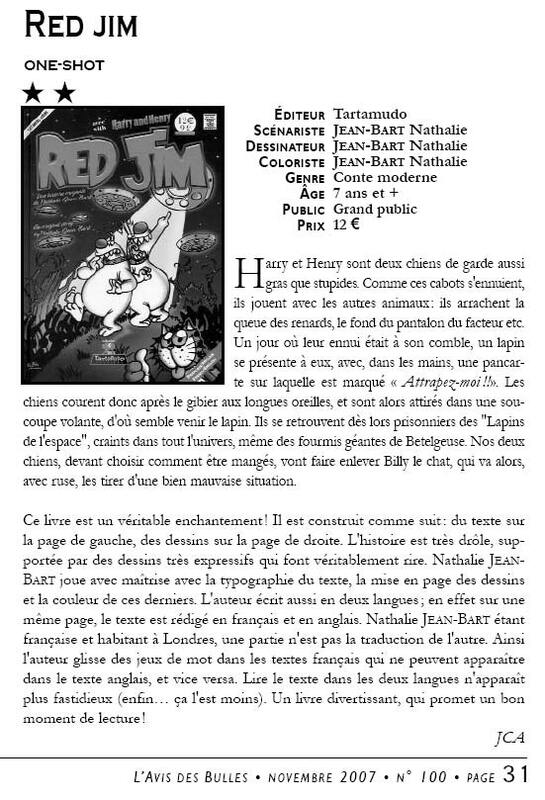 The author's also written the story in two languages: the text is shown in French and English on the same page. Nathalie is French and lives in London: some parts of the text aren't the literal translation of the others. The author inserts puns in the text in French that cannot appear in English and vice versa. Consequently, reading the text in both languages doesn't seem tedious anymore (at least, not as much...). Van den vos Reynaerde was originally a Dutch medieval fable, composed in the 13th century. A piece of anti-semitic children literature was named after it before being adapted into an animated movie. Since this AWN article was published, the rest of this film has been found in 2005. Once restored, it was shown at an animation festival in Utrecht in 2006. 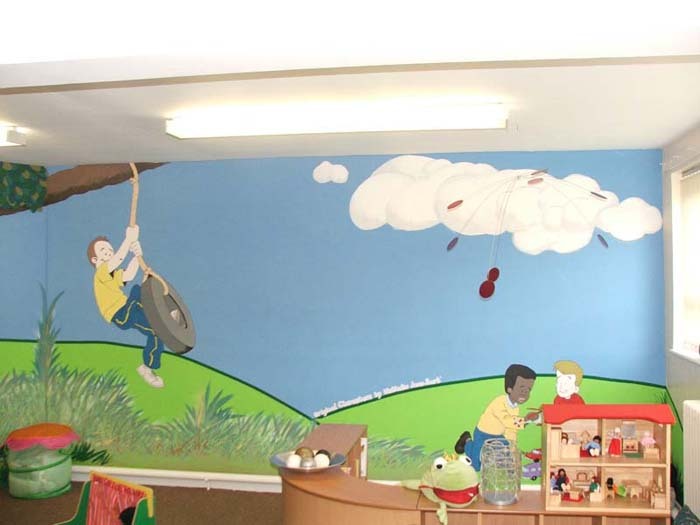 This is a collaboration between me and a mural artist, done some time ago now: he got in touch to use my children characters to decorate the walls of a therapy room, in a school in Manchester.